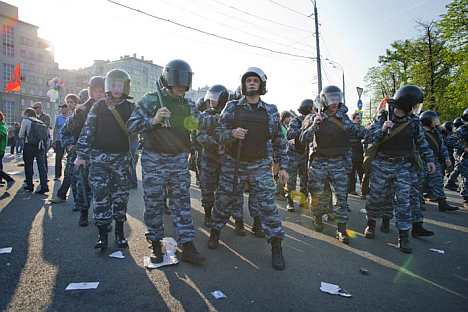 Russia's police officers broke up protests in Moscow as Vladimir Putin inaugurated. Russian police say they detained 300 people in downtown Moscow on Monday as demonstrators gathered to protest the return of Vladimir Putin to the Kremlin for a third term. Protest movement comes to an end? Some people of those 300 have been detained and then released several times, police said. Some 200 people wearing white ribbons – the symbol of Russia’s For Fair Elections protests – marched along downtown Tverskoy Avenue before gathering near Red Square as Putin’s inauguration ceremony got underway in the Kremlin. The protesters were detained for “attempting to stage an unsanctioned protest,” police said, adding that the situation in the capital was “generally calm.” Opposition leader Boris Nemtsov was among those detained. He said he was sitting in a cafe close to the route taken by Putin’s motorcade when he was detained. “They hit me and ripped my clothes,” he told RIA Novosti. The arrest was Nemtsov’s second in less than 24 hours after he was detained at Sunday's opposition rally in downtown Moscow, along with more than 400 other protesters, and ordered to pay 1000 rubles ($30) for breaching rally regulations. In a new twist, several people with white ribbons were later detained near the fountain on Chistoprudny boulevard in central Moscow where several dozens of demonstrators moved from Tverskoy Avenue.